Friday was full of my favorite things, starting with getting my hair cut. I’m pretty low-maintenance about my appearance, but have always been a bit vain about my hair. Now that my stylist doesn’t work weekends, I actually take time off work and drive 45 minutes to get my hair done, because I’m just not ready to find someone new. As usual, Missy did a great job and we had a good chat about music, books, blogs, and the like. After a quick lunch, I went to another of my Santa Cruz haunts, the Del Mar Theatre. The Del Mar originally opened in 1936 and has a beautiful art-deco interior. When I was growing up in Santa Cruz, the Del Mar had been chopped into a four-screen theater. I can’t begin to guess how many films I’ve seen there over the years! On Friday, I went to see Frank. When it was playing here in San Jose, I didn’t really know anything about it, but as soon as I saw a trailer, I wanted to see it. Weird, dark comedies are generally appealing to me, particularly when the cast includes the likes of Michael Fassbender, Maggie Gyllenhaal, and Domhnall Gleeson. The first time I remember seeing Fassbender was in Jane Eyre, but he really knocked me out with his performance in Shame. My experience at the movie didn’t start off well — some loud, hipster UCSC students sat right in front of me, despite lots of available seats, and talked all through the trailers. This would have been frustrating in any case, but was particularly bad because they had nothing to say that wasn’t rude and negative. I moved to another seat before the film started. Once I was out of the “too cool for everything” section, I really enjoyed Frank. Domhnall Gleeson plays Jon, a naive young musician who is so motivated to be a part of Frank’s band, Soronprfbs, that he cannot see how he begins to destroy the band. Fassbender plays Frank from inside the big head*. When I saw Her last year, I wondered how it must have been for Joaquin Phoenix to perform with an actor who was not in the room, especially when I found out that Scarlett Johansson re-recorded her character’s lines in post-production, replacing Samantha Morton. With Frank, Fassbender was in the room, but must have felt somewhat separate from the other actors…I can only assume that it was quite a challenge for him and for his co-stars. Maggie Gyllenhaal’s Clara was defensive and angry throughout most of the film. Her deadpan game, as displayed in the trailer above, is strong and very entertaining. The character development of the remaining cast wasn’t particularly filled out, but I very much enjoyed the look and feel of the film. The music, written by Stephen Rennicks and performed by the actors, was suitably bizarre and surprisingly captivating. I recommend this film. Afterwards, I headed over to my sister’s house for dinner, hanging out with my nephews (this mostly consisted of watching YouTube parodies until it was time to put them to bed), and helping my sis move furniture. All in all, it was another fun day in Santa Cruz! I’ll leave you with a shot of a street musician. 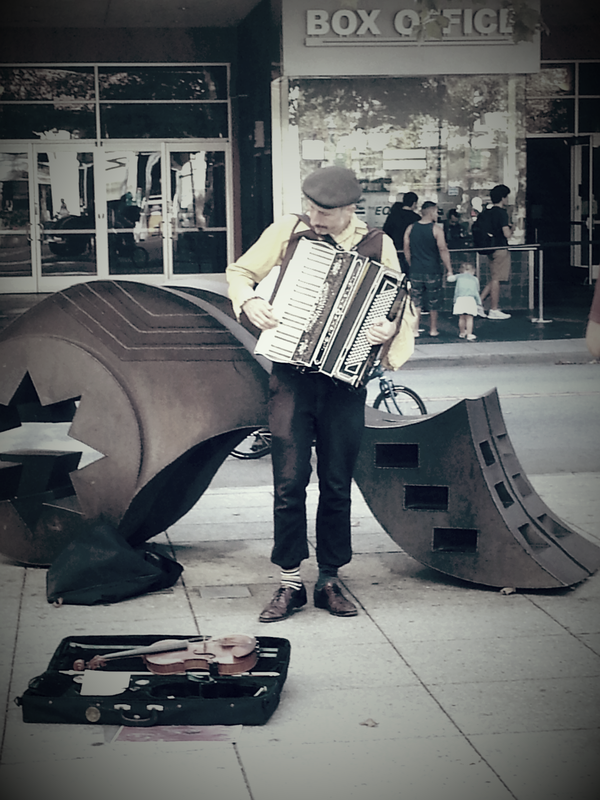 I loved his old-fashioned looking accordion. *Although the inspiration for the main character came from Frank Sidebottom, a comic musician with a papier-mâché head, this was not a story about Sidebottom or his creator, Chris Sievey. I believe there is a documentary, Being Frank, in the works about Sievey/Sidebottom.